Of course, it was so much more than that. We had an official place in the church and we had responsibility to these kids. And pizza. A lot of pizza, along with our fellowship. We played wild and crazy games, we talked about Jesus. We travelled to Disney for Night of Joy, and to Detroit for Acquire the Fire. We must have been doing something right... for these parents to trust us with their kids. But we were just babies ourselves... learning more about our faith right alongside these teens. I loved the desire I saw in the kids. Their fire for loving Jesus. And it kept me on the path to my own growth. Before we knew it, the church decided to send us to a conference. In New Orleans. The site of the 2001 National Youth Gathering for the Lutheran Church. The plan was to attend the conference, get to know the city... and bring our youth back the following summer for the Gathering. On that trip, we fell in love with New Orleans. We walked everywhere, taking in the city. Around each corner there was something new and different. And while the city is known for the too wild Bourbon Street and Mardi Gras, there is so much more to see and experience... if you are willing to look beyond the surface. 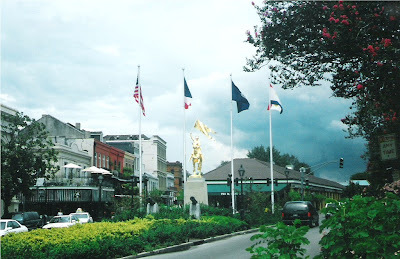 A little hotel in the French Quarter. Beignets at Cafe' du Monde. A street car ride though the garden district. Pecan waffles at Camellia's. And barbecue shrimp at Mr. B's. Yes... New Orleans filled us up with their food... but also with tools to bring home to our youth. And a fire within for the Gathering. We headed home... bellies full and plans in the works. The fundraising took center stage as we prepared for July 2001. Oh, goody. I knew you had a New Orleans story to tell. Looking forward to hearing the rest of it! I remember hearing about this trip...this joy you both felt on this journey together. I love revisiting good memories with you. So...I was a youth ministry major in college and I love working with students! At this season of my life the opportunities are few and far between...but I still am involved some. Even was the speaker at our church's high school retreat two years ago...so fun. Love that youth ministry is in your story too...looking forward to reading more. How cool that you and your hubby did this ministry together. Doesn't the Lord just know how to help us grow while helping to usher others into His kingdom? !